Bennington College's with their new, smart technology! Traditional circulator pumps, used in tandem with hot water boilers to move heated water, operate at a single speed regardless of demand. High-performance circul ator pumps use higher-efficiency motors and vary their speed to provide only the level of pumping required. Holly Anderson, the Project Manager at Bennington College, notes “Understanding how to make new technologies work with existing systems is always a learning experience. 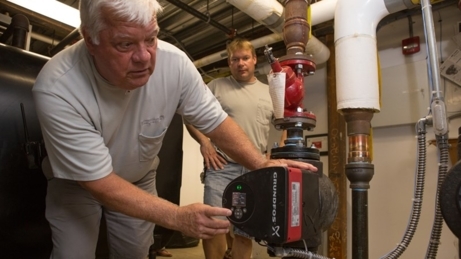 It took the expertise of the manufacturer, our campus staff installing the equipment, and Efficiency Vermont working together to solve the issues that arose."